The reason that sites like this need encouragement is that long-time kooks like Gene and Alex will die one day (maybe not Alex) and their web sites will disappear when their estates forget to pay the hosting charges. Leon at Fair Dinkum is well placed to take over and has shown that he has the requisite amount of crazy to fill the gaps and be a worthy successor. During the week I was told that Meryl Dorey from the Australian Vaccination Network was to appear on a radio program, possibly to discuss matters which related to an ongoing court case that is of interest to me. The radio station is called Fair Dinkum Radio and exists only on the Internet. For those not familiar with the intricacies of the Australian language, "fair dinkum" is one of those expressions (like the German "Schadenfreude") which takes a lot of words to describe to a non-native speaker, but essentially it means "in accordance with the spirit and ethos of being a true Australian". Calling someone "fair dinkum" is high praise and means the person can be trusted with your wife (but not necessarily your daughter), your ute and your beer. I haven't listened to the entire broadcast yet so I won't comment on what Ms Dorey had to say, but the first part was an unhinged rant by the show's host about the mass of conspiracies that are all around us. If I tell you that he likes UNESCO but hates the UN and he thinks that the Australian Commonwealth is a private corporation you might get an impression of his grasp on reality. What I did notice, however, that the show used some iconic Australian music to reinforce it's fair dinkum qualifications. I wondered if the composers of these tunes were aware of their songs appearing as parentheses around alternating floods of mouth foam and flashes of white hot burning stupid. Thank you so much for your email and the information, we will certainly look into this. 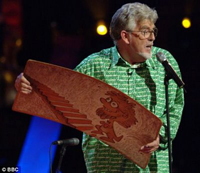 You're absolutely right, "a conspiracy theorist" is certainly a title that doesn't apply to Rolf. Again thank you for getting in touch and I send my very best wishes. 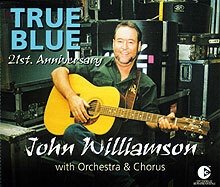 The next musical interlude was "True Blue" by John Williamson. I think this is a bit dirge-like, but apparently Australians go weak at the knee and wet at the eye when they hear this outside the country. It actually contains the words "fair dinkum". My email to John was similar to the one sent to Rolf. A lawyer is involved! Wonderful. My work here is done.